It has been less than two weeks since we got back from Japan, we have two more trips on the calendar, and are already talking about our next trip to Europe. Anticipation is as much a part of the journey as the trip itself. The next trip is a quick jaunt to Eastern Washington for a dinner at VanArnam Winery. 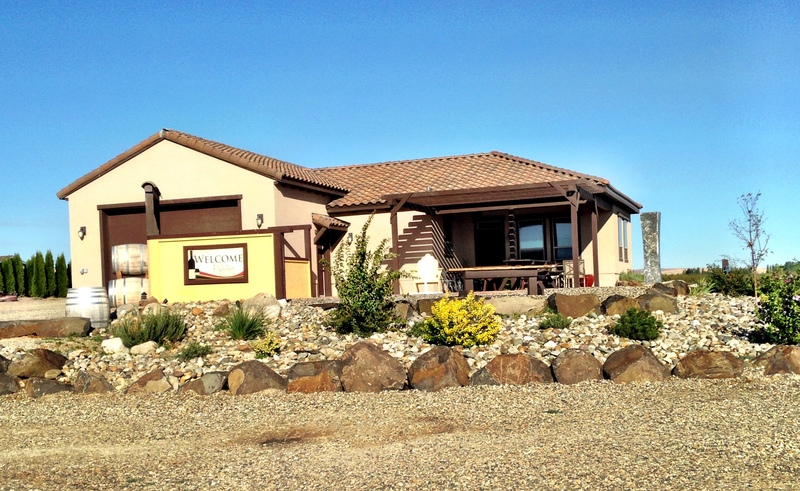 They are a small winery in the Rattlesnake Hills AVA, part of the Yakima Valley wine region. Unfortunately this area does not get the recognition of the Washington Wineries further East. The landscape is much more like the Oregon or Sonoma regions, more green and hills. The vineyards are interspersed with the fruit orchards, VanArnam actually started as apple growers and still do. A week later we fly to Sonoma, a few days in wine country – sipping, eating, and hiking. 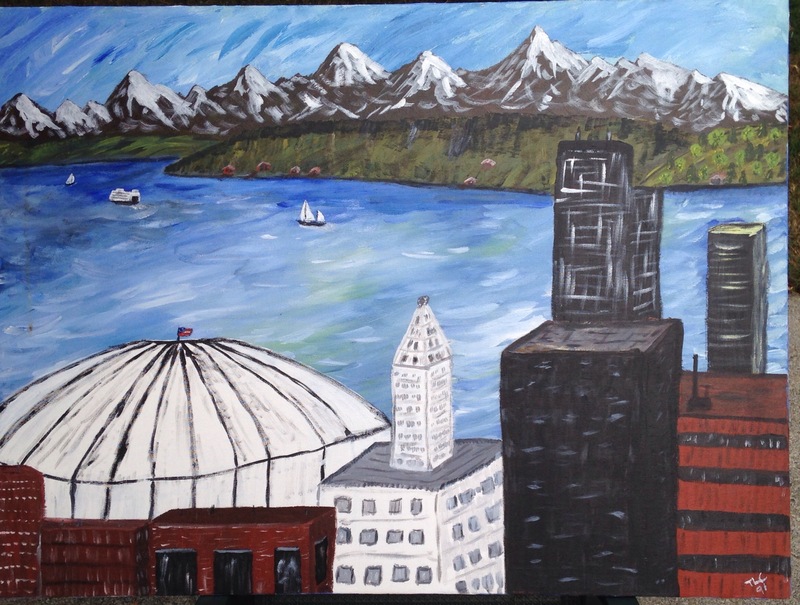 Then we drive to Crater Lake National Park, more hiking and some painting. Then we drive home through Eastern Washington, just might need to make a stop along the way to pick up a wine club or two. Next year though, Europe is on the radar. I have only spent 2 days in Italy, Tricia has not been there, so it is about time. Tricia has a friend who lives north of Inverness, I have a friend near Edinburgh, so Scotland is in the mix. There is a used bookstore in York, and San Sebastian in Spain is enticing. You can see there is lots of talk, web searches, and planning to come. Nothing like a glass of wine, some cheese, and maps to make for a perfect evening. Personally I am on a quest for a Victorian Journal. I saw two on our last trip to Bath, England. Long before the days of recording life with photos and Facebook, people would have a journal that they would take when they went to visit friends. They would exchange the journals during their time together and each would make an entry in the others. Sometimes a paragraph, or maybe a poem, a sketch or a cartoon. These were treasured, a record of friends and family more personal than selfies on Instagram. The two I saw were at a book fair, for sale, but sadly not in the budget on that trip. So this trip we plan to hit used book stores and watch for book fairs. We are always traveling, even on a Saturday morning like this, while sipping green tea made in the teapot I brought from Japan. I guess this is what they call wanderlust, a favorite pastime for theWinesketcher. Taking a break this morning to reflect on the things that get me through the challenges. I have been on over 20 flights in the last 11 weeks, thankfully none this last week. On the week-ends we pretend to be contractors, doing the repair work left us by our anniversary week-end flood in December – Wainscoting, painting, repairing sheetrock, installing a cabinet, ceramic tile, etc. Two weeks ago I was in the Holiday Inn next to Disney, in Anaheim. It is a short walk to Downtown Disney, and Catal Restaurant. Upstairs at Catal is a quiet oasis in the chaos. A glass of wine, bacon wrapped dates, calamari, and of course pen, ink, and paint, made for a nice break from the travel. The next week I had Asian Meatballs and broccoli, in Sirachi sauce at Niki and Joe’s in Newberg. We finished the evening with a we dram of Laphroaig, and my first game of Catan. I slept well on the hide-a-bed, visited by Nuli, their way too cute kitten. Last weekend Tim came up, a good excuse to put the construction on hold, and instead too much food, some good discussions, and a bit of guitars and singing. Thursday night of this week Tricia and I went to Daniels for Happy Hour. Just what we needed before this weekend of the final push in the basement. These breaks make it possible to go on, food and friends have always been part of what we humans need for rejuvenation in the midst of challenges. I am so grateful. 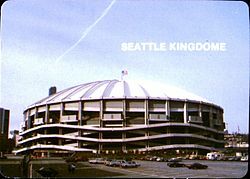 The Kingdome was almost as iconic to Seattle as the Space-needle. Yet it is no more. Once the home to the Seahawks and the Mariners, as well as the Sonics for a bit. I did this painting just before it was demolished. It also includes Smith Tower, and Columbia Tower. It is a 30″x40″ acrylic on canvas, brings back memories but it needs to hang someplace where it will be noticed so am looking for a buyer, maybe a bar in the area? If you know someone let me know, I am sure we can find a reasonable amount. Of course between most of these I was back in Seattle, then off again. Not complaining but I must say I am glad that things are a bit slower in July. Now I can focus on painting bathroom, working in yard, and getting ready for two, yes two weddings this month. July 11, my sister gets married and I get the honor of officiating. Then on July 31 our daughter gets married, should be a wonderful day. Thankful ly there is time to sit on the patio by the garden and write on a cool morning before the heat comes, I love this yard. Then a glass of rosé after the work is done, after all thewinesketcher knows how to relax as well. Hopefully August will not be as frantic, that is the plan. Steuben and Traminette, these are grapes? Steuben and Traminette? These are grapes, not as familiar as Chardonnay, Pinot Noir, Merlot, Syrah, etc. They are hybrids of French and American vines designed to withstand the climate of the Midwest and the Northeast parts of the United States. Traminette is the State grape of Indiana. 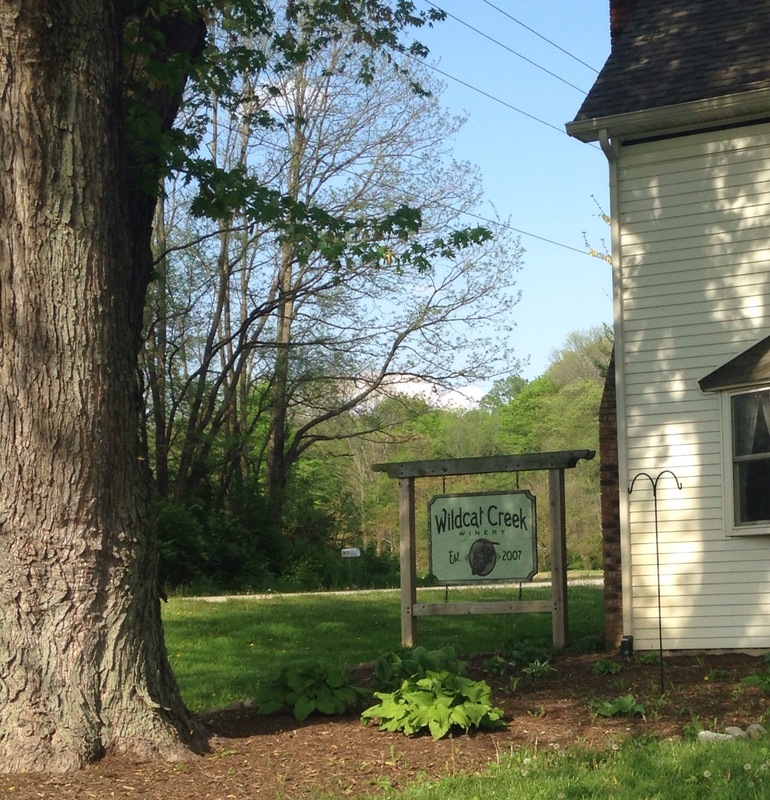 I visited Wildcat Creek winery in Lafayette, Indiana, curious to try some wines that were different from the West Coast, French, or Italian wines that I am familiar with. The tasting room is in an old Hoosier home, Rick is the winemaker. He came into the wine world less than 10 years ago, yet his wines have won numerous awards in the Indiana wine competitions. Even the dry wines they offered me, red or white, would most likely be classified as off-dry on the west coast. Since most of these grapes are also used as table grapes the sugar content is quite high. The feel is more thin, and most of the taste stays in the front of the mouth, very little finish to speak of. Compared with the Washington Chardonnays and Syrahs, or an Oregon Pinot Noir they would be described as undeveloped. I resist the temptation to compare because they are a different grape, and for a different taste. It is more like saying do you like tea or coffee, both can be good, both are different. It was 85F and the Steuben reminded me a lot of slightly sweet rosé, it was served chilled. 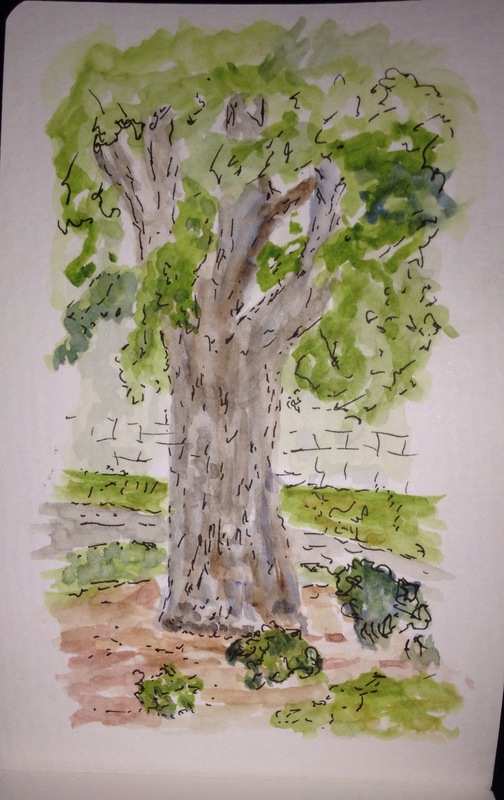 I sat on the deck and sketched an ancient tree, all in all a pleasant afternoon. A warm summer evening, a serendipitous encounter, a surprise birthday party, a missed release event, and some much needed winding down, each produced one of five memorable winery visits in 2014. One was in Woodinville in early summer, three were in Eastern Washington in August, and the last was Oregon in December. Torii Mor Winery, from the Dundee Hills of Oregon, opened a tasting room in Woodinville, Washington in 2014; one of the first Oregon producers with a tasting room in Washington. They bring excellent offerings of the Pinot Noirs that have made the Yamhill wine area famous to Washington, a bold move for sure. A few weeks after opening they held a party, Washington club members, of which there are many, brought friends, and other folks to whom Torii Mor was unknown joined them. It was a simple affair that showcased why I am enamored with wineries – great wine and interesting people. We met new friends, even discovered that some old acquaintances were Torii Mor fans. The party was a success, and the evening memorable. Visiting wineries while on business trips is one of the advantages of being theWinesketcher. August 2014 took me to Toppenish, Washington to teach communication and time management, the schedule was such that I had two half-days to explore the Rattlesnake Hills Wine region east of Yakima. My objective this day was Dineen Wines, I had met one of the owners while sketching at Bonair the day before and she invited me to stop by the tasting room. When I got there it was closed, but being in the mood for a glass of wine and my paints I set off exploring. A mile or so down the road I spotted an easel-sign pointing up a gravel road through an apple orchard, Reflection Vineyards, and the tasting room was open. I spent an hour or so sketching while sipping their Viognier. I wrote a blog, you can read it here. Reflection Vineyards is one of our favorites these days. Just days later my wife and I were on a trip to the Prosser area for my birthday. We planned to stop at Kestrel’s Prosser Tasting room to pick up a club shipment, and to have a picnic on their patio. We were just settling in by the fountain when our simple picnic turned into a surprise birthday party with the arrival of Brian and Anita, they made a special trip just to join us, they are great friends. While I was traveling that month, Tricia attended a release event at Bunnell in Woodinville. She was so impressed that she took me back the next Friday. We had what amounted to a private tasting, in part because they forgot to turn the sign from closed to open until we were about done. The wine was amazing, the cheese and olives fit, and the conversation entertaining. The best part, they decided to show some of my artwork. By the time Christmas is over each year I am tired and ready for quiet, and intimacy. Catching up with family and friends is fun, but draining, always lots of energy and emotion. We drove to Canby, Oregon to see my granddaughter and her new husband, exchanged presents, and had a spirited Nerf gun battle. Then Tricia and I headed for Ponzi. We had a club shipment to pick up, which was actually just a good excuse to have some Chardonnay and cheese. Their new tasting room is comfortable, with an amazing view; it was just what theWinesketcher needed to close out the year. I am sure I have quoted my uncle Farquhar before, and probably will again but it fits this year. His opinion on pie was that, “It’s all good, but some’s just better than others.” Well most wines and wineries are good, but some’s just better than others.” For me in 2014 these are a few that stood out. With our niece from San Diego in town for Christmas it only made sense to hit a couple wineries in Woodenville last Friday. A great time, along with varied experiences. First stop, Long Shadows, our daughter is a club member, and I think this was her first membership. Their concept is a bit different. They are a winery with a number of different wine makers. The founder, Allan Shoup, an icon in Washington wine and former CEO of the Chateau St. Michelle conglomerate, invited seven winemakers from around the world to contribute one label of wine using grapes from Washington. The results are wonderful, and tasting them is a showcase in winemaking. But this article is about the wine room experience, and Jordan made it relaxing and personal. Alexis called in advance, as is common courtesy when you have a larger group tasting, we had six. When we arrived she started to introduce herself to Jordan, as soon as she told him that she worked at Torii Mor Winery, he immediately called her by name, turned and greeted all of us. Then he directed us to an area of overstuffed chairs and a couch. He knew we were coming from the voice mail Alexis had left and made us feel welcome. We sipped and chatted, and bought a few bottles. Next stop, Goose Ridge, and though I have written here that Torii Mor was our first club, I now think it was Good Ridge. We ended the membership a few years ago because they did not have any club options with whites included, and they make some great whites. They too were warned in advance that our group was coming, yet what a difference. There was little or no greeting, they seemed surprised to see us. We found a place to sit, then waited. After some time one of us went to the counter and asked what we needed to do. The response was a confused, “We didn’t know what you wanted.” It really seemed like we were a bother. We did get one glass, but with little or no explanation of what we were drinking, and none of the enthusiasm for the wine that Jordan had shown. We did not complete the tasting, I offered to pay for them all, no complaining, just that it wasn’t working. Thankfully they did not charge anything, and we left; no inquiry as to why, no apology etc. I am disappointed that what was a positive memory from the past was tarnished; I trust it is not the norm and optimistically hope the next visit will be improved. Airfield is next to Goose Ridge and always a fun place to visit. We had not planned on stopping there so they had no advance notice that we were coming. We went in and as usual it was a more lively atmosphere, a trademark of Airfield. Jim and Jim manage the room, they have for years, I asked them if we were okay coming with six, as I expected it was not a problem. We met Dave, not sure how long he has worked there, but new to us, he showed us a great time. We all bought wine and ended the tasting day on a high note. The fourth tasting was on Sunday the 28th in Oregon. Tricia and I were there to visit some family missed at Christmas. We stopped at Ponzi, a long time favorite of ours, we sat in their beautiful tasting room, sipped Chardonnay with a plate of cheese and olives, watched people and savored the view. It was nice to wind-down after the hectic holidays, Katie was a pleasant server, the sun was out; this is what wine is all about. Wine is more than a beverage, definitely not for getting high, it is an experience of the senses, and people. The tasting room experience is so important, thus I blog more on the whole event than just the liquid in the glass. January is a slow time in the wine world, many tasting rooms limit hours. But this means less crowds, more personal attention for those who do venture out. So theWinesketcher’s advice is venture out in January, you will find it pushes the gloom of winter away, and the wineries will appreciate your visit and business. For centuries, wine cellars have been dark, windowless spaces with bottles stuffed into cubbies, more function than form. But that doesn’t suit a new generation, for whom wine collecting is as much a social hobby as an investment strategy. So wrote Lisa Selin Davis in an article for The Wall Street Journal on October 16, 2014. This is one of the cellars featured in her article, yet this is not what theWinesketcer’s cellar looks like. One contractor, quoted in the article, said his custom cellars start at $10,000; some were well into 6 figures, a bit beyond my budget, even if I did have a house with the square footage for such a wine cellar. OK, I will admit a bit of envy, they are beautiful. Thankfully you do not have to have an air-conditioned, custom designed wine museum to enjoy your wine to the fullest. So what about the rest of us? There are many varietals of wine drinkers. Most wine is drank within a day or two of being purchased; no real need to think about how to store needed. Then there are those who like to accumulate wine. It could be a few bottles of a favorite label picked up on a visit to a winery, shipments from a wine club, or just the convenience of having wine on hand to pick from. Once the wine bug bites you will find that you buy an occasional bottle that deserves to be aged or at least saved for a special occasion. Those who invest the big bucks to create these wonderful cellars have taken wine to a different level; wine becomes a collector’s item or an investment. They spend far more for bottles of wine than the other 80-90% of wine drinkers, and it justifies having a cellar that matches that investment. It is easy to see the attraction, but most of us can enjoy the pleasure of wine without the intensity. We may be “new generation” yet “function and form” may be just fine. When you have more than a bottle or two to keep, a few simple concepts will serve your wine well. First, if you are going to drink it in the next 3 or 4 days you don’t have to be overly concerned, just away from heat and you will most likely be fine. Secondly, know that most decorative wine racks are not great places to store wine for more than a day or two. The tops of refrigerators are frequently adorned with some wood or wrought-iron wine rack holding a half a dozen bottles. This is about as bad as it gets. It is too hot, probably too much light, and then there is the vibration of the refrigerator, which just irritates the wine, and it rebels by breaking down into an inferior beverage. Furniture and kitchen designers make some beautiful wine cabinets and racks, the problem is, you will want to keep them on display, they are furniture. That means they will most likely be located in a part of the house that is too warm for wine to thrive. Wine likes to sleep – so vibrations and frequent movement disturb the rest. Wine hates dry corks – so except for screw tops, which are no sign of inferior wine, it should lay on its side, all the better for sleeping. Sparkling wines can be stored upright because the pressure keeps the humidity in the bottle high enough to keep the cork damp. Basements, or closets in a spare room (that is not always heated) work great. Do you need a wine refrigerator? Maybe. My daughter lived in an apartment with no air-conditioning, it was hot in the summer, no place cool enough for happy wine. So she needed a small wine refrigerator. If you start to explore some higher end wines that you plan to keep longer, or are just worth extra protection, then a wine refrigerator for those makes good sense. Wine responds to just a bit of care by giving us great enjoyment. Set up your own cellar, whether 10 bottles or a 100, then when the urge for a bit of cheese and a glass of wine hits, you are ready. A long snowy drive over the pass was adequately rewarded with a visit to Reflection Vineyards. Holly was as entertaining as ever. The biggest revelation was that their reds are about as good or better than anything we have ever tasted; the Viognier that first attracted me last summer was just as good. There are a couple of our other wine clubs, yes we joined Reflection, that may not make the cut. In the current edition of Wine Spectator, James Aube’s column addresses when it is time to leave a wine, time to try other tastes and vineyards. This visit to Reflection sparked that discussion for us, and then a discussion of why and how we are going to choose wine clubs in the future. We are currently members of 8 yet I anticipate that will drop a bit before the spring shipments. The wine must not be readily available at the local grocery store. The first point is obvious, if the wine is average then why bother, part of the reason for a club is to keep good wine on the table. There are plenty of good wines at Trader Joes and Total Wine, we buy our fair share of those and always will. Wine club wine needs to be a notch above. Secondly, a wine club is more than just a way to make a purchase. It includes the experience of place, and people. The wine clubs that I enjoy most offer pleasant surroundings and people, along with the glass of wine. Reflection does this well. Their tasting room is a small house looking building with a patio as big as the building. It sits on a hill overlooking grassy field with a hammock, fruit trees, and vineyards. The owner and winemaker, Kent VanArnam, was easy to talk to the one time we met, and Holly’s wit makes it work; she also knows wine and what is behind the wine making. Another benefit of club membership is having a place to visit where you get free tastings, and a place to hang out for a glass. Some wineries even have private rooms for club members, but I am learning that many of those are the larger operations that may conflict with my desire for more boutique wines. Last summer I sat on the deck at Reflection and did a quick sketch over a glass of their Viognier, a pleasant hour for sure. The third criteria for selecting a wine club is availability, Reflection is only available through direct orders or their club, so if you want to drink it at home, you get it there. There is of course the feeling of exclusiveness; we have a wine that is not on every table. But more than that is the chance to expand your cellar beyond what the grocery store offers. So we are glad that we stopped by, I am pleased that I stumbled on to Reflection in August when Dineen Vineyards was closed, I still hope one day to get there, I have missed them 3 times now. We tasted some good wine, we found a good club, and it motivated me to consider how to decide to join wine clubs in the future. Wine is a major hobby, and wine clubs are part of what makes it fun. TheWinesketcher says, “Join the club!” If you are new to wine, find a winery you like, then join the club. 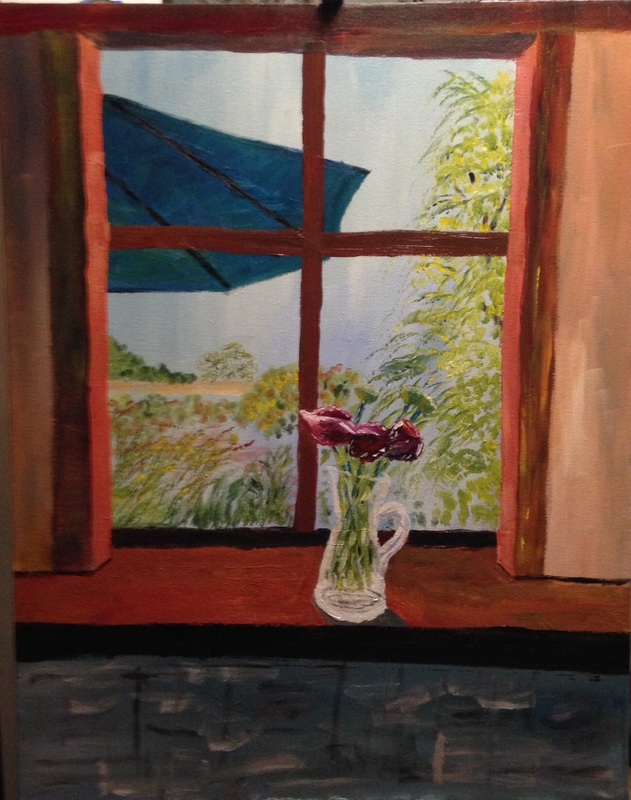 Bunnell Winery has my art on display and for sale. So thrilled! 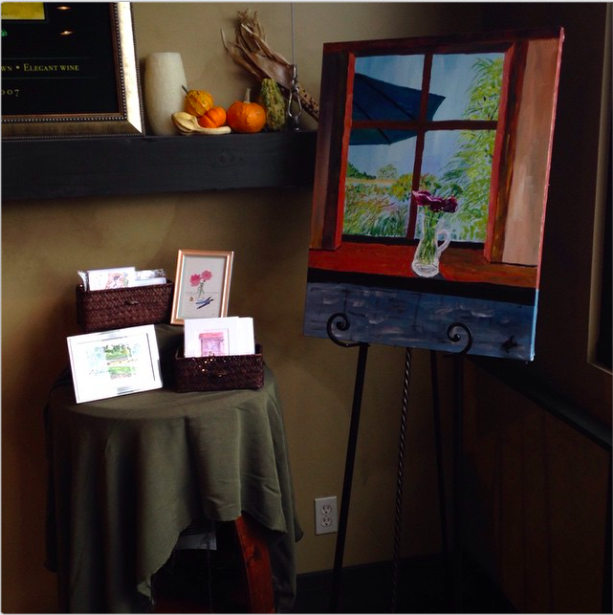 Bunnell Winery in Woodinville, WA has a display of a new acrylic on canvas of mine, and matted prints and cards for sale. Bunnell is one of my favorite wines, their Lia, Via, and Syrah are always the best. Stop by, have a sip, and take a peak. See more sketches and art at theWinesketcher.